We acknowledge the Traditional Owners of the Bundjalung land upon which we live and work. We pay respect to their Elders, both past and present. The Yoga Shack is home to an immense love and passion for yoga, land and environment, we aim to maintain equal respect for all human beings as manifestations from the same source. Yoga here is a tool for healing as well as for building on existing strengths, to enable the individual to be at their fullest potential. At The Yoga Shack everyone is embraced. Each and every student valued for their own journey, personal experience, their heart, creativity, smiles and energy. The physical practice of yoga is carried on the deeply established foundation of high quality breathing and at all times students are encouraged to explore comfort and steadiness. There's a strong and respectful sense of community within The Yoga Shack sanga, this is not just about breathing, bending and stretching this about belonging; a sacred space to drop deep, to release, to receive, to transform and to be free. Yoga Therapy prescribes specific practices to individuals, based on present problems. It is a pro-active, complementary modality that puts health and wellbeing back in the hands of the individual by utilising the tools of yoga - body movement, breath techniques, sound and visualisations specifically tailored for each student. Yoga Therapy can be used to support any existing problem, as well as any other modality. The first session in clinic consists of a thorough one-hour consultation and the prescription of your very first practice. Yoga Therapy is a self-determined modality of wellness and progression of health, Lissie will provide the tools, you will bring yourself out of problems. With 15-years of study and practice in bodywork: acupuncture, shiatsu, feng shui, zen thai shiatsu as well as his role as a highly studied, lauded and loved yoga teacher, Shane’s massage technique and his beautiful disposition forms a remarkable way of moving prana whilst facilitating a deep state of relaxation. Having completed his foundational Zen Thai Shiatsu studies with the acclaimed and joyous Gwynn Williams, Shane is also a level one Zen Thai Shiatsu trainer, holding 4 day Level I trainings in the glorious setting of The Yoga Shack. General classes are available to anyone in a good state of overall health. If this applies to your current physical and physiological situation, then general classes are an excellent way to deepen your knowledge of yoga for your home practice, as well as form vital and rich connections with other people in this wonderfully supportive community. If you are currently experiencing injury or an illness, we request that you see Lissie for Cikitsa practice (yoga therapy) in order to individualise your practice, using the tools of yoga to come out of problems. Private classes are available for individuals or for groups - having a hen’s party here in the Byron Shire? Then a class for the bride-to-be and all her hens is the most wonderful way to prepare for such an important commitment. An ongoing series to extend the knowledge of yoga out beyond the tools themselves, to bring the sanga (community) together in a greater role of support and socialisation and to deepen our understanding of all elements of yoga. Each event we examine a different topic and then look at it in the context of life! We’ll look at obstacles, real life examples, share stories and inquiries, all from the basis of the texts of yoga. In this upcoming event we will be looking at the concept of ahimsa (non-harm) and how we perhaps might apply it in our daily lives, how it relates to ourselves and to others. 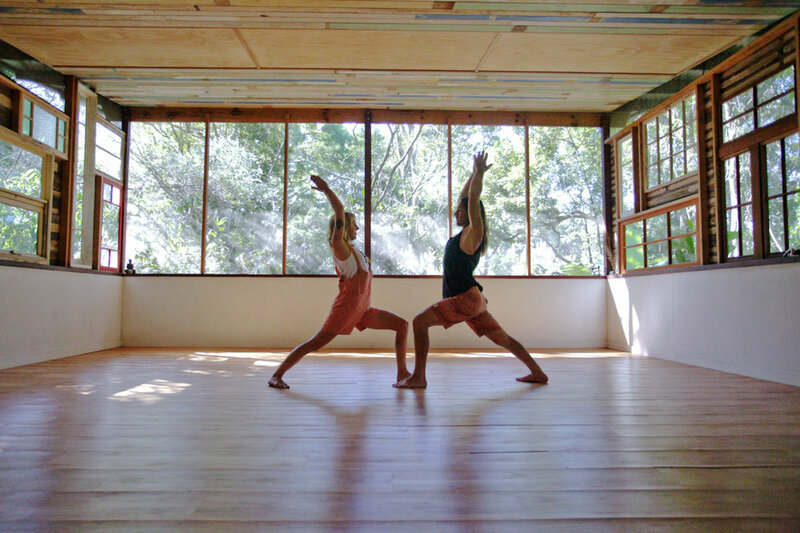 So happy to have Gwyn Williams come and spend some time at The Yoga Shack in May! Gwyn will be offering a class 'Embodying the practice of Zenthai: the Art of Focused Intention'. A playful and seamless flow through yoga, movement and connection. If you’ve never spent time with this joyfully embodied yogi, treat yourself to this very special gift. Limited space so jump on board asap if interested. Join Lissie Turner (Yoga Therapist) and Tahlia Mynott (Holistic Nutritionist) for this celebration and exploration of the ever-changing and life-long journey of our hormones; from the exuberance of puberty to the time of the wise-woman of menopause and everything inbetween. Utilising this 4-week framework, we'll move through practices of yoga, focused breathwork, bodywork, sharing circles, nutrition and tools of deep relaxation, relevant to each phase. Offered during school holiday periods, these workshops are a super fun introduction to the concept of yoga as a means to keep our bodies healthy, for celebration of ourselves as unique individuals and acceptance of the ever-moving stream of life-experiences. These workshops remind children of what is already within; courage, kindness, FUN and creativity.